The guitars do most of the talking throughout the record. There’s a subtle surf influence at work, but instead of the fluid and meandering tone of that genre, this captures the choppy aspect of being at sea: finding the current and riding it out but with some rough bumps along the way that make the ride more fun. 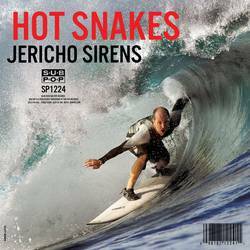 Ultimately, Hot Snakes are a classic rock ‘n’ roll band, with lyricism to match that primal intensity. Rock music keeps cycling through new styles and spinoffs, but there’s a reason why everything comes back to this style. Hot Snakes have it down pat, fitting into the modern era while encompassing what made it a genre in the first place. Play it loud and on the open highway. Posted Jan. 28, 2019, 8:15 p.m.